Sparrows offers the Baltimore-Washington corridor an incomparable selection of French antiques, including 18th through early 20th century furniture, lighting, ironwork, sculpture, paintings, majolica, faience and pottery, country to formal, in a full range of styles and periods up to and including Art Nouveau, Art Deco and Art Moderne. After 36 years in business, we are retiring, and have decided to close our brick-and-mortar store. Our entire showroom inventory is now being liquidated, with every single item on sale. Our website does not reflect sale prices - call or email for the latest pricing. 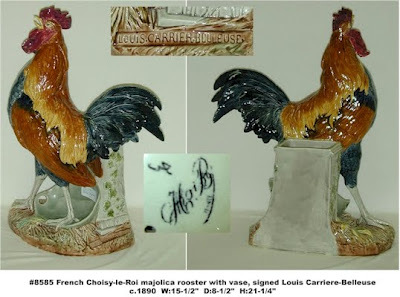 Beginning January, 2010, we will begin to accept items for restoration, and expect to resume offering an exceptional selection of French antiques through our website. We thank you for your support and appreciation over these may years. We are closing our brick & mortar location. Everything in our current inventory is on sale. We can be reached by e-mail (sparrows@sparrows.com) or telephone (toll free 1-888-800-1235) for more details. 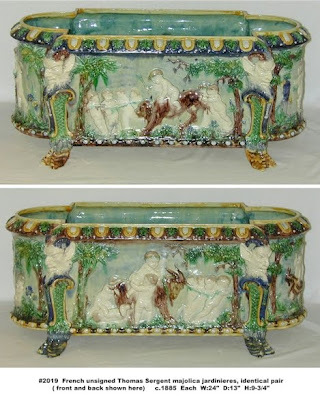 We have so enjoyed collecting majolica and along the way meeting so many wonderful collectors. Let us know if you would like any more information about anything.